Accessories — Key Systems, Inc. Some keys are so important that they require an additional layer of security. Conceal and protect the keys within your Security Asset Manager™ by using our Key Shield. This metal shield, when locked in our SAM with a Tamper-Proof Key Ring®, traps and conceals your keys within the shield, preventing duplication. Once released from the SAM, the Tamper-Proof Key Ring® slides down the shield body moving your key(s) into a functional position. KSI Key Shields are available in either red or blue colors. Eliminate your unused, high-risk keys in seconds. Lost, broken, worn out or stolen keys are security breaches waiting to happen, usually leading to the diversion of large amounts of time and money. For these reasons, Key Systems, Inc. developed the Key Destroyer. Made a bad cut on a high-risk patented keyway? Retiring a key? Feed them to the Key Destroyer and eliminate any potential risk. No pieces. No bumping. No potential problems. In seconds, the Key Destroyer grinds away the shaft of the key blank, leaving only the “head” for record keeping. It’s quick, it’s convenient, and it’s fail-proof. This shield protects the user's PIN entry from others who may be able to view it. The Keypad Shield is secured to your Security Asset Manager™ in position over top of the keypad or display screen so as to guard your PIN entry from plain view and keep your PIN information confidential. These aluminum risers are fitted right below the Security Asset Manager™ cabinet and extend down towards the floor. These risers ensure the overall product height extends below 26 inches from the floor, where ADA requirements apply. The vaulted top accessory is great for keeping your key boxes or lockers safe from spills and clutter. Eliminating the flat surface atop the unit ensures that it will not be used as shelving for beverages and other items that could spill and cause damage to the unit. Backer Boards are a great accessory to utilize when mounting your Security Asset Manager™. Too many holes in the wall? Can't find a wall stud for safe and proper mounting of the key box? The Backer Board is great for finding your mounting position on the wall exactly where it is desired. The SAM is then able to be screwed onto the Backer Board and sit on the wall completely secured and covering any holes or imperfections. This accessory stops handcuff chains from hanging loosely or dangling below the key box in work areas. They tray is installed at the bottom of the SAM panel as a means of catching the low-hanging chains from handcuffs and preventing them from hanging out in the open. This product is used mainly for SAM units that operate offline. The ethernet port is an easy way to download reports from SAMs that are not connected to the internet. 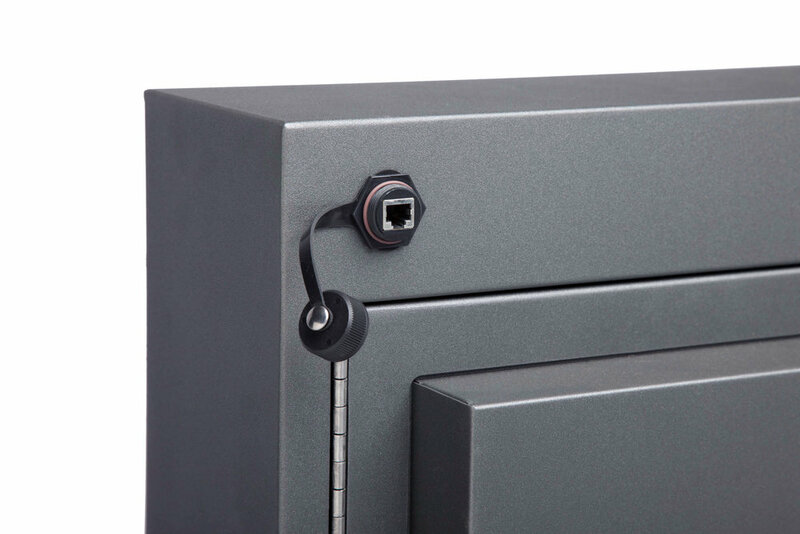 External ports can be mounted on the exterior of the box as shown or directly on the panel. Rain hoods are an ideal accessory for Security Asset Manager ™ units that are exposed to the outside elements. This hood is constructed of steel and is mounted behind the key box, hanging over the unit and protecting it from rain and other precipitation.